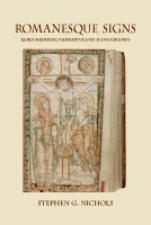 Title: Romanesque Signs: Early Medieval Narrative and Iconography Author: Stephen G. Nichols Series: Critical Studies in the Humanities Imprint: The Davies Group, Publishers soft cover 336 pp. USD 28.00 ISBN 978-1934542217 February 2011 Romanesque Signs is a classic of medieval scholarship that laid the foundations for viewing literature as an historical artifact that should be read in conjunction with the art, architecture, sculpture and religious rituals produced in the same period. It was the first book to argue that the materiality of representation—how art was created, performed, displayed in its own time—must be taken into account in order to understand its levels of meaning. It also showed that the way this art engages with the history it inherits—secular history, sacred history, intellectual history—is of crucial importance for understanding how and why it was produced as it was. Underlying the book’s thesis is the recognition that Romanesque art reflects history, the world, and sacred history as themes that must be interwoven and choreographed in and as a performance. Hence the term “performative mimesis” used to describe it. The book seeks to overthrow post-Reformation boundaries between the sacred and the secular in order to show that in the early Middle Ages these terms were co-extensive. The sacred and secular existed in equilibrium: the one did not seek to displace the other since they were part of a continuum, each referencing the other at every moment. This revision contains a new introduction and an entirely new chapter on the origin of the term “Romanesque.” Contents List of Illustrations Preface, 2010: Romanesque Identities Preface to original edition 1 The Discourse of History 2 Historia and Theosis 3 Charlemagne Redivivus: From History to Historia 4 Historia and the Poetics of the Passion 5 Roncevaux and the Poetics of Place/Person in the Song of Roland Epilogue Notes Index Author Stephen Nichols, James M. Beall Professor of French and Humanities at Johns Hopkins University, specializes in medieval literature and its interactions with history, philosophy, and history of art. He holds an honorary doctorate from the the University of Geneva and was made an Officier de l’Ordre des Arts et Lettres by the French Government. In 2008, he received a Research Prize from the Alexander von Humboldt Foundation. In 2010, he received a Mellon Emeritus Research Fellowship.Recent publications include Rethinking the Medieval Senses; L’Alterite du Moyen Age; Medievalism and the Modernist Temper; The Whole Book; The New Medievalism; and Mimesis from Mirror to Method, Augustine to Descartes. Romanesque Signs received the Modern Language Association's James Russell Lowell Prize for an outstanding book by an MLA author.